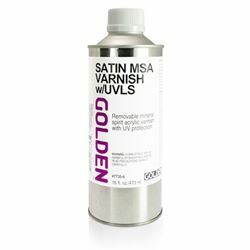 MSA (Mineral Spirit Acrylic) Varnish with UVLS (UltraViolet Light Stabilizers) is a Mineral Spirit Acrylic-borne resin system. 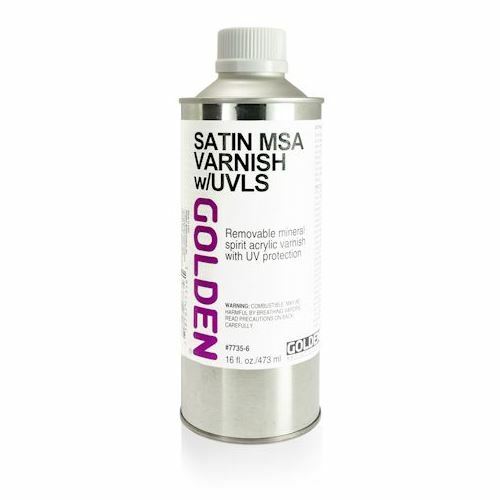 MSA Varnish forms a tougher, less permeable film than waterborne acrylic emulsion varnishes. It reduces dirt penetration and surface marring, offering an extremely level film with less foam and fewer pinholes. Removable with turpentine after drying. Available in Gloss, Satin and Matte. Recommended for either interior or exterior use. For use on acrylics, oils, temperas, watercolors and various other media.